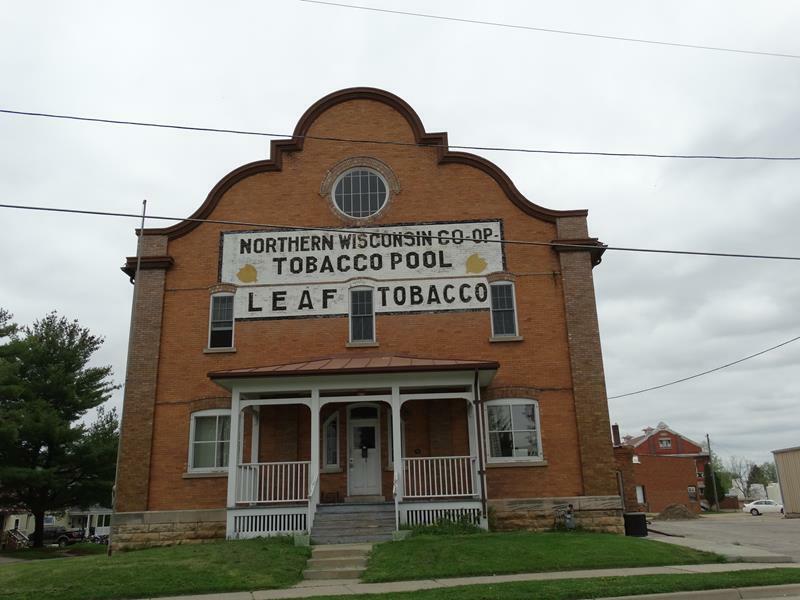 In Viroqua just east of downtown along Highways 56 & 82 you’ll find the Northern Wisconsin Co-op Tobacco Pool Warehouse. It was originally built in 1906 by Martin Bekkedal, who immigrated to Wisconsin in the 1880s and became the largest tobacco wholesaler in the state at a time when tobacco was one of Wisconsin’s biggest cash crops. Despite the curious fact that it’s actually in southwestern Wisconsin, what makes it unique? Well, it became the nation’s first tobacco marketing cooperative. They formed as a response to a significant drop in the price of tobacco in 1921. Its method of enlisting most of the area’s tobacco farmers to better control market prices – creating a tobacco “pool” – inspired the emerging pool of dairy farmers in the state and became the model so many ended up using. Now privately owned, this historic building contains offices, a receiving room where tobacco got weighed, storage areas, and “sweating rooms” where tobacco was heated to 115 degrees for curing. (Today, they could do “hot yoga” classes in there.) It is not currently open for tours, but it would be a good idea. You’ll find the Northern Wisconsin Co-op Tobacco Pool in Viroqua along Highways 56 & 82 (Decker Street) just east of the north-south main drag that is also U.S. 14/61 and Highway 27.